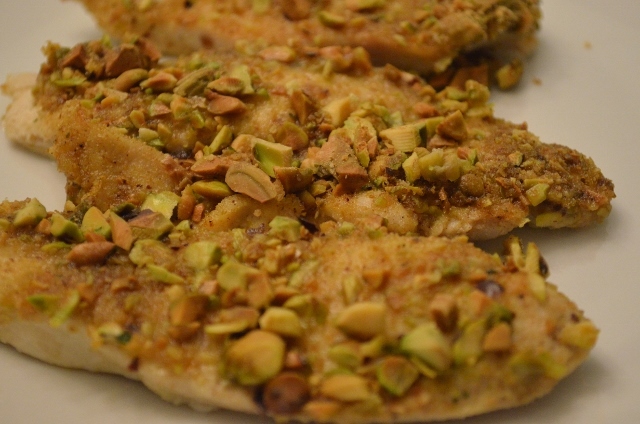 Here is an easy recipe using chicken breasts with a crunchy coating of chopped pistachio nuts mixed with curry powder. Easy to mix and bake and ready in 20 minutes! 1. Preheat oven to 350 degrees. Lightly coat a baking dish with nonstick cooking spray. If using whole chicken breast, slice into strips lengthwise. 2. Arrange chicken pieces in a single layer in baking dish. 3. Combine pistachios, bread crumbs and curry powder and sprinkle evenly over chicken. Spray nut topping lightly with cooking spray. 4. Bake for 25 minutes or until internal temperature of chicken reaches 165 degrees and nut topping is lightly browned. What’s not to like? Pistachios, curry, chicken! Sounds delicious! Thanks, leftover strips were good topping for a salad.